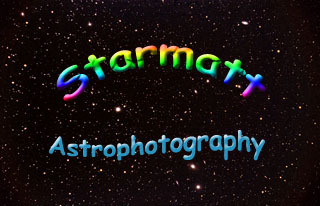 You can easily install an automatic Windows desktop background changer that displays images from starmatt.com. First, download either the small image zip file or the large image zip file. If you are on a 56kb modem or slower, downloading the large file will take 40 minutes or more. Unzip/extract the JPEG files into a new folder in your file system. If your computer is not already configured to unzip the above file, then download the WinZip evaluation first. Download the WallChanger shareware installer and run it to install it. Configure the WallChanger settings to create a new theme called astro. Add the above folder to the theme. Under Wallpaper options tab, configure it to change every minute. Set the display function to Center. The wallpaper images are strictly for personal use and may not be redistributed in any form.